Nothing can come between me and a piece of chocolate cake, or a whole chocolate cake. If we hadn't given away the leftovers, I would have gladly eaten it for breakfast. We spent February working on "love foods" for the Free People blog. This chocolate cake was definitely my favorite. It also coincided with our anniversary, making a nice little celebration cake. We aren't vegan, but try to work it in when we can over there. This cake is vegan friendly, and if you didn't know that you would not be able to tell. I think flavor is one thing that steers me away from vegan baking more frequently. There's a lot that goes into those substitutions and I can often taste a big difference, but this is just plain good. For the FP blog, the chocolate sour cream frosting recipe was adapted for those that are vegan, but here I will posting to use regular sour cream. I don't love the ingredient list on the packaged vegan sour cream, and I would recommend trying out a homemade recipe. We also ended up doing a little cake video test with the amazing Christian Graham, one of Free People's videographers. It's a really nice starting point for future short video features we may be working on. Preheat oven to 350° and prepare pan with cooking spray and set aside. In a large bowl combine flour, sugar, coca powder, baking soda and salt. In a separate bowl combine canola oil, vinegar, water, and vanilla extract. Pour the wet ingredients into the dry and stir to combine until smooth. Split the cake batter in half between pans and bake for 23 minutes, or until cooked through. Let cakes cool to room temperature before frosting. Using a double boiler, or small saucepan over medium heat, melt the chocolate chips and transfer to a stand mixer. Let the chocolate sit to room temperature. Add the butter, sour cream, confectioners sugar and vanilla and stir until the mixture becomes fluffy, forming small peaks. 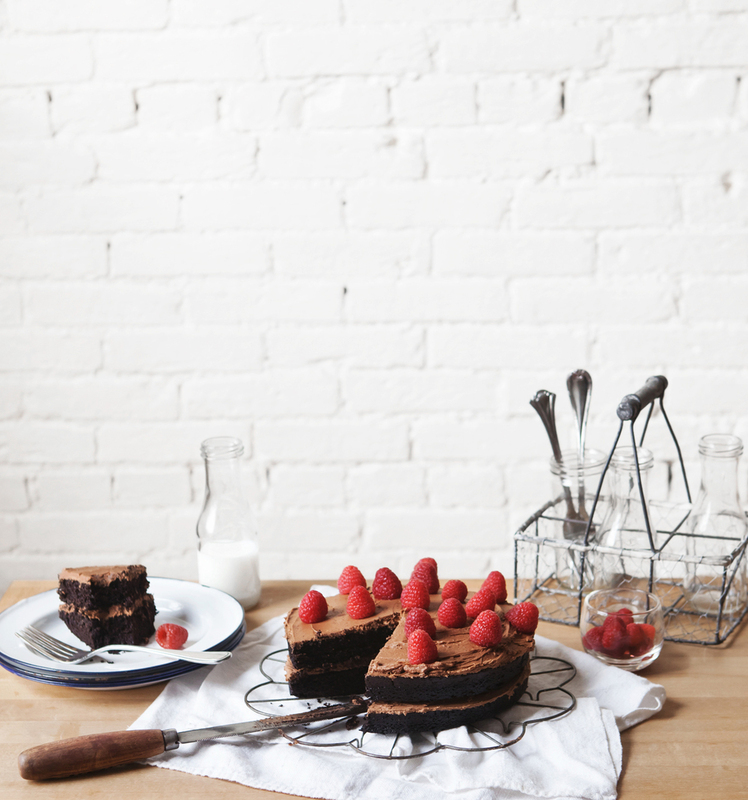 Spread the frosting evenly across the vegan chocolate cake and top with fresh raspberries.